Once the undisputed king of social media (at least in the U.S.), MySpace last week declared what amounts to a post-modern armistice, announcing that they will integrate status updates with Facebook (and Twitter). MySpace used to be Janet, and now it’s LaToya – at best. While the erosion of the MySpace user base has been ongoing for years, the fact that it was purchased for $580 million just five years ago says all you need to know about the vagaries of online leadership. Coincidental timing too, as Yahoo! gave up their search engine duties in U.S. and Canada to Microsoft’s Bing last week. Approximately 10 years after having 67% of the search market, Yahoo! is now out of the business entirely. Ouch. But back to MySpace. Where did it all go so wrong? What can we learn from its death spiral? When MySpace was growing rapidly, the Web was a different place. Stemming from the IRC and discussion forums of old, it was routine (accepted and expected even) to have an online pseudonym. “BunnyBoy213” was your handle. That’s how people knew you on instant messenger, AOL chat rooms and a host of other places, including MySpace. We easily forget that Facebook was one of the first social networks that insisted that we use REAL names, and policed personal profiles accordingly. Even during Twitter’s short life, I’ve seen a significant shift toward real names, and away from “@TwitGurlPower” and accounts of that nature. Haven’t you? The success of Facebook – and the corresponding demise of MySpace – is partially due to real names adding an aura of legitimacy while removing a layer of creepiness. The attraction of these early social networks wasn’t the connectivity, is was the homesteading. For no money at all, you could have your own page on the World Wide Web, and when even small Web hosting packages were $250/month, a free page was a big deal. MySpace adopted that spirit of personal scrapbooking, and let its members commit unspeakable crimes against HTML, fonts, color schemes, and animation. Facebook is the Model T of social networks. As Henry Ford once said, “you can get this car in any color, as long as it’s black.” Facebook allows minimal customization in terms of overall layout, look and feel. The fact that essentially every major corporation in the U.S. has agreed to allow their brand to be represented online in a way that conforms with Facebook’s unilateral set of rules speaks directly to the power of the Facebook user base. Apparently, once we were given the opportunity to completely screw up our own Web pages, we decided that maybe we were better off if social networks removed some of the sources of our own visual and layout demise. MySpace was slow to adopt mobile technology, and the lack of MySpace in your pocket was part of what killed them. Facebook has been mobile-focused since it was even marginally practical to be so, and the most recent estimates I’ve seen show that upwards of 65 million Americans access Facebook from a mobile device monthly. Further, mobile users actually spend more time on Facebook, not less. Facebook rolled out their iPhone app in August, 2007. MySpace answered in July, 2008 – almost a full year later. During that period, approximately 12 million iPhones were sold. MySpace has always been about myspace.com, which was a tremendous cash cow. Before advanced contextual and retargeting capabilities became the norm, MySpace’s ability to target banner ads based on members’ interests was a huge edge. I remember quite clearly being told that one of my regional clients couldn’t advertise on MySpace.com because we didn’t have a budget of at least $25,000/month. I wonder if that policy is still in effect? There has never been any sort of major effort to distribute MySpace broadly across the Web by baking it into other sites, applications or circumstances. Facebook realized at least two years ago that the future was not Facebook.com per se, but in making Facebook the plumbing of the Web. Facebook Connect was the first step toward becoming the single digital passport for all of our lives. The Open Graph API was a giant leap past that. It wasn’t that long ago that MySpace wasn’t just big, it was positively cool. Cutting edge. MySpace’s roots in the Southern California music scene gave it real-world credibility that other social networks have never enjoyed – and MySpace is still a major player in the music world. But because of its roots – and possibly due to conscious decision-making by its founders and early management – MySpace has always been user-focused, rather than business-focused. MySpace has rarely created features specifically for business, or done much to make MySpace a safer, more controllable venue within which corporations can participate. By way of example, here’s a search for “Snapple” on MySpace and Facebook. 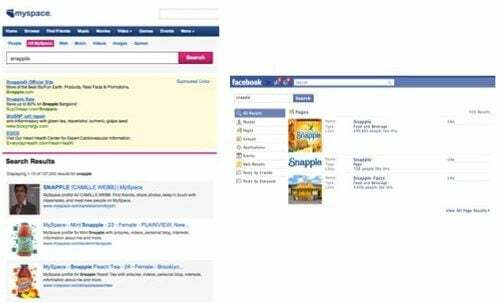 MySpace has 107,000 search results for “snapple” including dozens or hundreds of member profiles claiming to be various beverage flavors. Facebook has 423 search results, and the first one shown is the official Snapple page. While Facebook’s unceasing carousel of changes to specific aspects of pages, status updates and the rest is maddening, those tweaks typically make Facebook better and more valuable for business. Many of the missteps that contributed to MySpace’s decay were based on the company not moving beyond its core proposition. It’s understandable on one hand. In 2006, you have a veritable ATM machine, with companies begging you to put banner ads on your site. You’re the number one social network in the world. You sell for $580 million to Rubert Murdoch and Fox. But then the trouble begins. Fox wants to recoup their investment, not by doing new things, but by squeezing the turnip and doing the old things better, using Fox’s sales team as the vise. Meanwhile, Facebook comes along and sees a revenue model that’s not based on the banner ad, but rather on Google’s pay-per-click model (which businesses prefer because it mitigates financial risk). They recognize that the future is not in dot coms at all, but in deconstructing content and making it mobile and portable. Facebook sees that long-term, it’s about being a dandelion not a rose. But it was a lot easier for Facebook to pursue that path, because somebody hadn’t paid a truckload of cash for them and wanted to see a return on that investment. It’s a familiar tale. Nearly all the once mighty, now defunct social network or community sites unfurled and died after being purchased. The goals shift. 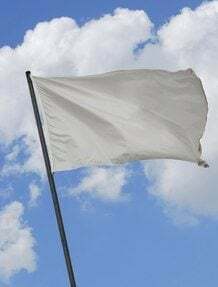 The founders leave. The tools of social media always change. And that’s why your social media strategy must be tools-agnostic. The next time you start thinking too hard about your Twitter “strategy” remember MySpace. Will you do that for me please?